Congrats to everyone in the DIY SEO course who completed the Jumpstart Challenge. I definitely appreciated hearing from y’all about how much you enjoyed the daily delivery of each challenge and reporting in and asking questions in our Facebook group. I’ll definitely be running the rest of the Workshops and challenges that way too. And, I’m looking forward to our first live Workshop with you today! We’ll be going deeper into the first phase of SEO, which is Technical SEO. We’ll be diving into how Google is crawling your site and what it is finding. Then in 2 weeks we’ll be doing our next live Workshop on Rising Ranking Factors so everyone will know about the big changes already here and those coming, and what we are working toward during the rest of the workshops. The really big news from the past week has been the release of info about CPU hardware bugs called Meltdown and Spectre. They affect every type of device that has a CPU from your cell phone, to your computer, and all the way up to host servers for your website files. The nice folks at BlogVault have a good post on how these hardware bugs may affect your site. Definitely a must read for webmasters. But the bottom line is, there is nothing we, as site owners can do about it. All of the patches have to be installed by the host. I really have no idea why they chose to break down host package types into shared, managed, and dedicated in this article, as if this hardware bug cares how the server is divided up. It doesn’t matter what type of host package you have, the bug is going to affect it. And your host is going to patch it. The other unhappy news about this is, if any of your info was stolen, you’ll never know. And I’m betting hosts will never tell. This is not like a normal hack attack that leaves footprints. The data is simple read from other programs. I’ll provide you with more info as I have it, especially if we start seeing reports of info that was stolen and how it’s being used. If you have an update available for your mobile devices or computer, get that done asap to help protect them. If you use any of these plugins, get them off your site now. They have changed ownership and have backdoor security issues according to the folks at WordFence. I take what they saw with a big grain of salt, but they are actively looking for ownership changes with plugins and for stuff like this happening. You can get more info about all of this on the WordFence post. Congrats to the nice folks at Foo Plugins for earning a spot on WPEngine’s Recommended Plugins list. WPEngine is a managed hosting provider and they are extremely picky when it comes to what plugins they allow site owners to use. Basically, you can’t use anything that is a resource hog. That rebuild made FooGallery a lot more lightweight, and thus faster. Plus, I just love the plugin. I’ve been using it for years on my carving site. So, if you’re looking for a nice gallery plugin, definitely put FooGallery at the top of your list. Several months ago, Google released a beta version to select users of their new Search Console interface. It looks really nice! Now they have started making it available to everyone who wants to switch over. It’s still rolling out, so you may not be seeing it just yet. And I think you still have to manually activate it for now. I’ll be switching over to it as soon as I have time. I’m thinking we’ll do a bonus session on it in the DIY SEO course. I’m betting that as they release it to more folks they will be getting more bug reports and such. So, I’m going to hold off making a public tour video of it until enough time has passed to work out any major kinks. This also means that I’ll wait until at least later in February to start making the new Search Console Basics course because I want to use this new interface for those tutorials. Mobile-first indexing. We’ve been hearing about Google’s move toward this for months now, but what is that exactly? The folks at Moz have a post that is a definite must-read for getting your SEO head in the game with this. 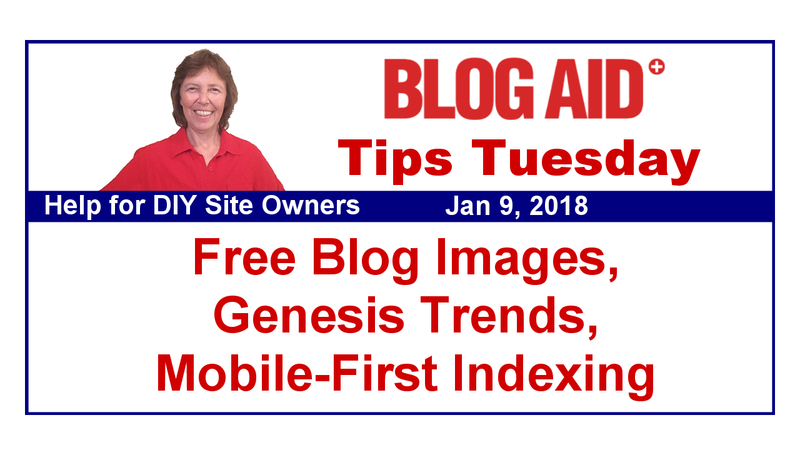 But in brief, it means that Google will start indexing the mobile version of your site first and will consider it the primary version of your site. It also means that when Google detects that a search is from a mobile device, it will show results at the top for sites that behave well on mobile. Okay, let’s break that statement down. So, let’s say that you have an authoritative post that ranks well in search now when someone does a Google search on desktop. But, if someone does that same search on mobile, and your site doesn’t perform well on mobile, then your post may not show as high in the results for that person anymore. Another authoritative post that has a better mobile experience may take your place nearer to the top. All of this means you need to start paying closer attention to how your site looks and behaves on mobile. Page load time is just one factor. UX, or User Experience is another. I’m working on documentation for proper testing on both right now and will have new tutorials for my Webmaster Training members and new tests for DIY site owners too. I’m 100% positive that these same 2 factors are going to be huge visibility factors for both Facebook and Pinterest this year too. In fact, speed already is a determining factor on both platforms now. Faster sites are simply going to get more exposure in those feeds from now on. And all of this is going to radically impact the way you create blog posts too. That’s some of what we’ll be covering in the DIY SEO Workshops toward this spring as well. We all need great images for our blog posts. And Social Media Today has compiled a fresh list of 28 places to source free ones. Also be sure to read the TOS on these sites, especially about the license and any link attribution needed. And for those of you new to blogging, don’t go grabbing graphics from Google images or such. If you get one from a site that paid to use it from a vendor like ShutterStock or such, the vendor will come after you and demand payment. And they ain’t cheap either. Just a couple of weeks ago I reported on Frontenberg, which is a new Gutenberg optimized theme with a front-end customizer. Now WPTavern has reported on the first Gutenberg Development Course from Zac Gordon. There’s also a coupon in the article to get the course on sale right now too. Zac aimed this course primarily at plugin developers, as they really have the biggest burden with the switch to Gutenberg. He said there are some tutorials for theme designers too, but he fully believes that most block styling and such will be handled by plugins. And I’m betting there will be Gutenberg courses for designers by no later than this summer because I believe that block styling will be the next big thing to learn for designers. I think a lot of us are going to wait and see which direction Genesis goes with this and follow that lead. So, it’s good to get in on the cutting edge of this, while it’s still simple enough to understand. But, maybe guard against jumping on the bleeding edge, as some elements of all this are still very much up in the air. If you design with Genesis themes, this is a must-listen podcast from StudioPress with guest Brian Gardner. He discusses the focus for StudioPress themes for 2018. Keep in mind this on the heels of WordCampUS in Dec where all the buzz was about Gutenberg and the future of WordPress. I spoke with Brian just after Matt’s State of the Word address, and he said that Gutenberg needed to go through many more iterations before they would be including it in Genesis. But, in this podcast, and in the one I reported a few weeks ago with lead Genesis developer Nathan Rice, it is super clear that Genesis is looking at the near future, and the changes they need to make to remain the top theme framework in the world. One of those new goals is to continue to release more niche-specific themes so that site owners have an easier time moving in with their content, and tweaking things like colors, and headers for logos and such. I think the success of niche-specific themes from the community of designers, like Foodie Pro and others from designer Shay, back that up. She has the top selling themes on StudioPress, and has for some time. These niche-specific designs are the short-term response to Genesis not having a drag and drop builder. Nor do they intend to go down that road until we see what plays out with Gutenberg. The reason being, as Brian points out in this interview, is that they don’t want to reinvent the wheel with a proprietary drag and drop solution. WordPress itself is creating that with the Customizer. And it makes more sense for Genesis to take advantage of that integration. Another part of the conversation that really stood out to me was the focus on themes that are AMP-ready. Joost de Valk (of Yoast SEO) made a similar statement a few months ago, that he thinks we’ll see AMP focused themes becoming more popular in 2018. To this point, most of my clients have not been able to make good use of AMP (Google’s Accelerated Mobile Pages). In fact, the ones who have tried it found it to be super hard to implement correctly, and it dropped their revenue like whale poop going to the ocean floor. So, we will all likely be looking harder at AMP integration this year as Google continues to improve it. But, this is definitely not something I’ll be focused on or recommending for most all clients for at least the first half of 2018. But in this interview, they do discuss the importance of designing for mobile and about speed. And that is something all of us need to pay attention to for all of 2018. So, if you are a designer, definitely worth listening to this entire interview about the base themes you’ll be using from Genesis this year and the important changes coming. It’s also worth you taking a look at my Webmaster Training courses for the tech side of creating secure, fast sites too, as that skillset is in high demand already, and will be something more and more site owners want the design team they hire to be able to do for them too. Site owners, if you’re thinking about a revamp this year, definitely put a site audit on your to do list too and get the drags off your site. And, get access to my webmaster designers who know how to create a theme with the future in mind. Share this post with all your blogger buddies. Thanks for the info about the StudioPress podcast. I use Genesis for all my blogs and I don’t want any of the to break after Gutenberg is released. Great post as always! There’s already a plugin so that we can use the same text editor we have now, so no worries about our sites breaking when Gutenberg rolls into the core. I’m advising folks to wait to incorporate Gutenberg until they have a fully compliant theme, and not to use it on current themes. Great post as always MaAnna, thank you. Yeah, the tech is advancing so fast it’s still hard to imagine what it will be like in 10 years. Virtual Reality is already here and websites aren’t far behind. That has a LOT to do with why WordPress is developing Gutenberg.